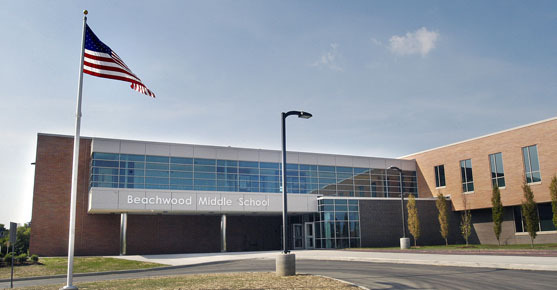 Beachwood Middle School -- honored by the Ohio Department of Education as a one of the top 10 middle schools in Ohio -- houses the Beachwood School District’s sixth, seventh, and eighth grade students. With an enrollment of 325 students and a certificated staff of 40, BMS provides a comprehensive model middle school program. BMS is committed to providing a quality educational experience designed to meet the unique needs of middle school students in an atmosphere of respect for individual differences in learning style, interest and personal development. What makes an education at Beachwood Middle School special? Many things. Some are obvious, like the warm, welcoming feeling you get when you enter our front doors. You'll see a joy of learning and kids actively engaged in their classes. You can sense the respect that exists between and among students, teachers, administrators and support staff. State-of-the-art technology; a laptop computer for every seventh and eighth grade student and teacher; TechTown; and free Internet/Intranet service for all students and staff. Model programs for both Gifted/Talented Students and Special Education Students, including a continuum of services and specially certified resource teachers. An inquiry-based science program incorporating Project 2061 and Project Discovery. World-class math instruction evolving from the TIMSS report, national math standards, and best practice research. A comprehensive unified arts program including exploratory activities in woodworking, video production, photography, cooking, sewing, technology and the fine arts. An immersion model foreign language program offering students their choice of three language classes that meet daily. A true team concept where faculty members meet daily during a common planning period on interdisciplinary grade level teams. This model of shared decision-making includes team-based discipline, interdisciplinary units, student and parent conferences, and both short- and long-term planning. An athletic program consisting of 17 sports. An advisory program where students meet with faculty advisors in small groups to discuss issues pertinent to middle school and engage in community service projects. A diversity training program for all students and staff facilitated by the The Diversity Center, formerly National Conference of Community and Justice (NCCJ). A 300-seat theater with full stage, lighting, sound system and dressing rooms. A full-size gymnasium with bleacher seating for 350 people. It can accommodate two basketball courts or three volleyball courts. A wireless computer network that facilitates Ohio’s first "one-to-one" wireless laptop program for students and teachers. Unified arts areas for instruction in cooking, sewing, fine arts, woodshop, technology, TV production, photography and ceramics. An indoor commons area and an outdoor courtyard in the center of the building. A large, centrally-located media center. Team meeting rooms for staff collaboration. Acoustically designed instrumental and vocal music classrooms and practice rooms. In 2008, BMS was identified by the Ohio Department of Education as one of the top 10 middle schools in Ohio. In 2004, BMS was named a “National 21st Century School of Distinction for Technology Excellence” by the Blue Ribbon Schools of Excellence Foundation. In 2000, BMS became the only Ohio middle school to receive a second U.S. Department of Education Blue Ribbon Award. In 1999, BMS received the Harvard Business School Club’s "Excellence in School Management" Award. In 1993, BMS was named a "U.S. Department of Education Blue Ribbon School of Excellence." In 1991, BMS was named the Ohio "Hall-of-Fame" Middle School.